Arvind Kejriwal Full Name is Arvind Kumar Kejriwal (born 16 June 1968) is an Indian social activist fighting for greater transparency in Government. He was awarded Ramon Magsaysay Award for Emergent Leadership in 2006, for activating India's Right to Information movement at grassroots and social activities to empower the poorest citizens to fight corruption by holding the government answerable to the people. Kejriwal is also a Saathi (fellow) of the Association for India's Development. 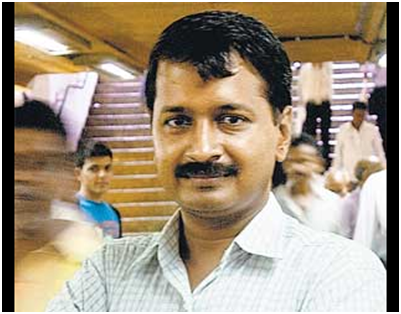 Arvind Kejriwal was born in Hissar, Haryana in 1968. His father was an engineer and he spent most of his childhood living in small northern Indian towns like Sonepat, Mathura and Hissar. Kejriwal graduated from IIT Kharagpur as a Mechanical engineer in 1989. As a member of India Against Corruption Kejriwal is an active participant in the movement for the enactment of Jan Lokpal Bill. He is considered a key figure along with social activist Anna Hazare. On August 16 2011, Hazare was arrested four hours before the planned indefinite hunger strike. Rajan Bhagat, spokesman for Delhi Police, said police arrested Hazare under a legal provision that bans public gatherings and protests at the park in Delhi where he was planning to begin his hunger strike. Kejriwal was also arrested along with other key members of the India Against Corruption movement. I Know Anna Ji is working as Bapu but Arvind Kejriwal you are also a "Devdoot" for our country who has born on this land to protect us from "Brastachar ka ravan". IS DES KO TUMARA JARURAT HAY"JAY HIND"
You are great. Corrupt Politicians should be ashamed of themselves. You are too great. Aap Ishwar ke awtar ho. No one can make sacrifices like you have done at this young age.May you prosper in your life and achieve whatever you desire. General Insurance Industry is full of corruption. The officials make money at the time of doing insurance,taking benami commission, appointment of surveyors, taking money from surveyors fees, from claims and then while making claim payments. Pl. study the whole system and see that this national problem is solved. At least 25 to 30% of the claim amount can be saved. Wow he tooo nhave done IIT in Mechanical field. He could too work in private companies. But he did'nt.That his speciality. He devoted his life for India. We all are with you sir. Indian youth is behind you and ANNA;the real indian leaders of 21st century..!!! an like u who is so much devoted for his ciuntry .sir ,u r a real hero of our country. Arvindji, You are a real model for todays youth of India. You must form a "Rashtriya Yuva Party" enrolling clean youths all over the country and fight the next election.I am pretty sure today's youth generation who are fed up with the curruption at every step willl support you 100% and change the face of India. I think it is the time for all the old horses to make them resign and give up the politics and a lesson to be taught if the youth government is formed. You & Anna will never win with the protest like you have been doing as they have the power distrup your movement and bring you down as the police department revolves on their fingers. India will only be free from all the evil matters if the police have the powers and do not bow down to the politicians who ill treat them. The police in India should be well paid well above the inflation rate to keep them away from the curruption so they can peform their duties and not thretend by the politicians & their families. The scheme is sort of a family created from objects within the sky. The Sun forms the centre of the scheme, and encompassing it area unit all the opposite family members: planets, their moons, asteroids and comets. The Sun’s gravitation holds the scheme along. It additionally provides United States with light-weight and warmth that area unit steam-powered by nuclear reactions burning perpetually within the Sun. while not this light-weight and warmth, there would be no life on Earth -- therefore the Sun is incredibly necessary to United States.